The MEP120P CD Sleever is designed as an easy-to-use bench-top unit capable of sleeving CDs in volumes more normally expected from expensive floor mounted models. 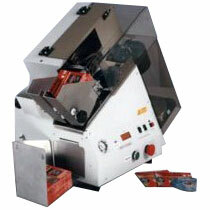 It can handle over three thousand CD sleeves per hour with cost savings of around 80%. The MEP120P can be quickly set up to deal with different types of sleeves – paper, plastic, tyvek or cardboard – a feature which will be attractive to operators needing to accommodate small runs in their programme.As an option, an attachment can be fitted to enable self-adhesive flap sleeves to be automatically sealed.The unit has an integral four digit counter, a selectable automatic stop after every set run of disks (adjustable from 0 – 9999) and can also easily be set to process users’ own spindles. The MEP120P provides a versatile, dependable and transportable CD sleeving unit at a price to meet the tightest of budget constraints, whilst the output of up to 55 CDs per minute means it can compete with the more expensive heavyweights. Takes just minutes to set up.